I don’t think I’ve ever been this excited about a sub-$2k watch before. 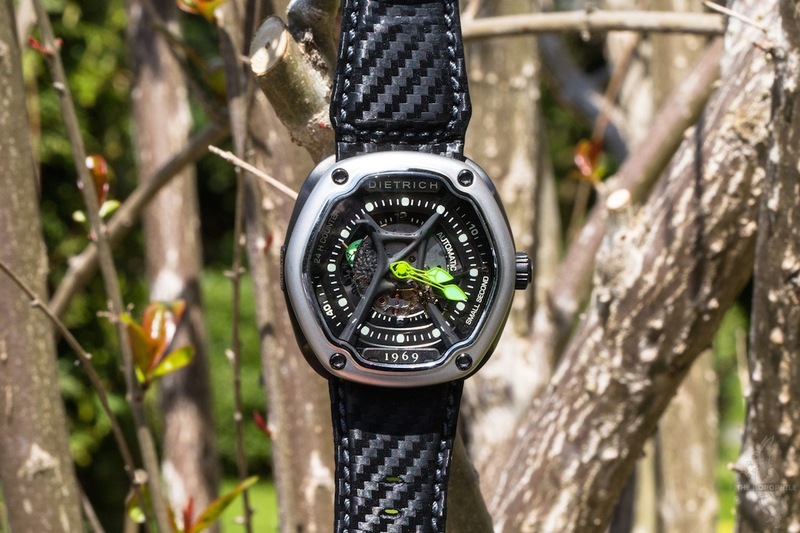 Among the multiple-axis tourbillons, Westminster carillon minute repeaters, engraved skeletons and mechanical daisies in my “Baselworld Top 20” list, one watch stands out by being way, way cheaper than the others, and that’s the Dietrich 1969 OTC-A01. Never heard of the brand before? 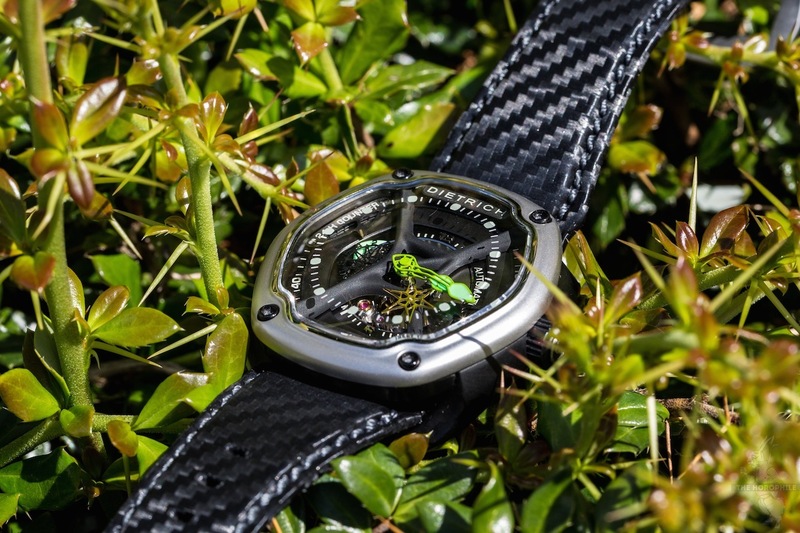 Neither did I until about a month before Baselworld 2014, but that’s because Dietrich 1969 has only been around for a year or so, and are only now beginning delivery of their first watch collection, the OTC (Organic Time Companion). 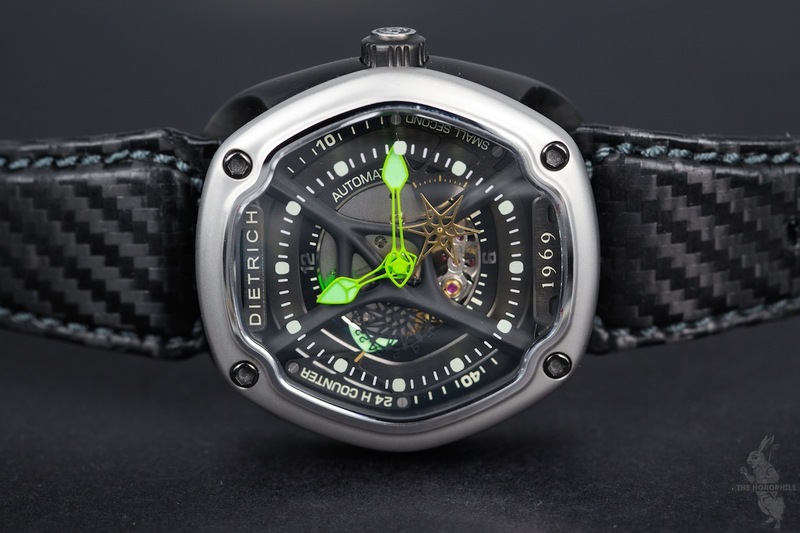 Dietrich 1969 is the eponymous brand of designer Emmanuel Dietrich. Born in the French city of Besançon in 1969, Emmanuel was no doubt influenced by the rich history of what can be considered the French capital of watchmaking. 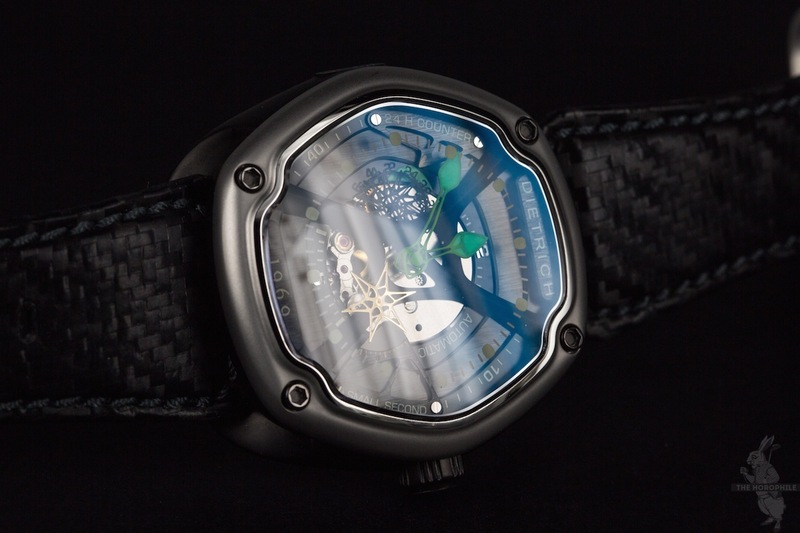 And while Emmanuel isn’t a watchmaker, he has designed watches and jewelry for some of the biggest luxury brands out there, including the likes of Hermès and Louis Vuitton. 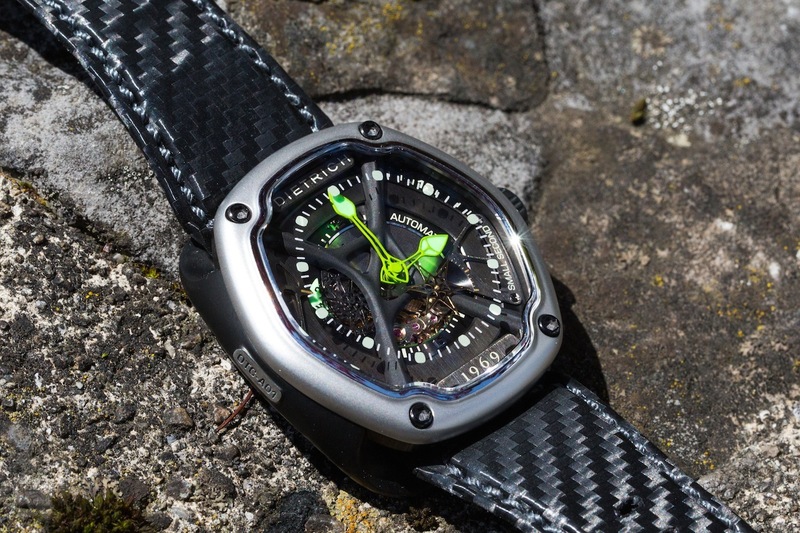 With a desire to bring to fruition his own unadulterated watch designs, Emmanuel Dietrich decided to create his own brand of original yet affordable watches. 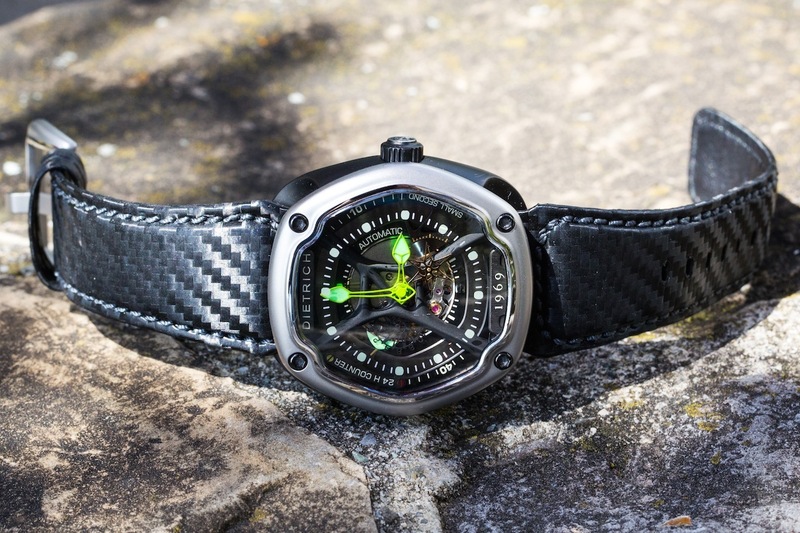 I’ll admit, the approach is not unlike that of SevenFriday, in the sense that they’re offering a unique, design-foucsed watch at an irresistible prices. 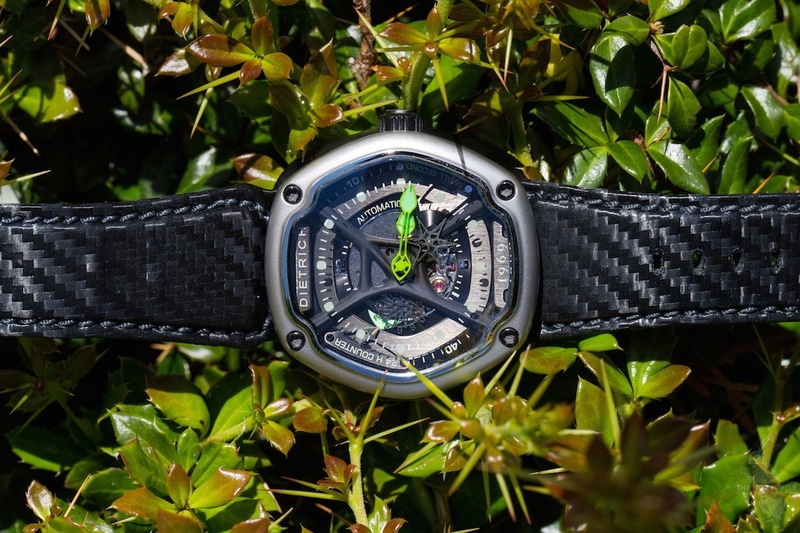 But the problem with trying to make an affordable yet original watch is the costs involved, especially if you’re planning to make it entirely in Switzerland. It’s downright impossible. On top of that, the lead times for development and production by Swiss subcontractors are borderline ridiculous. 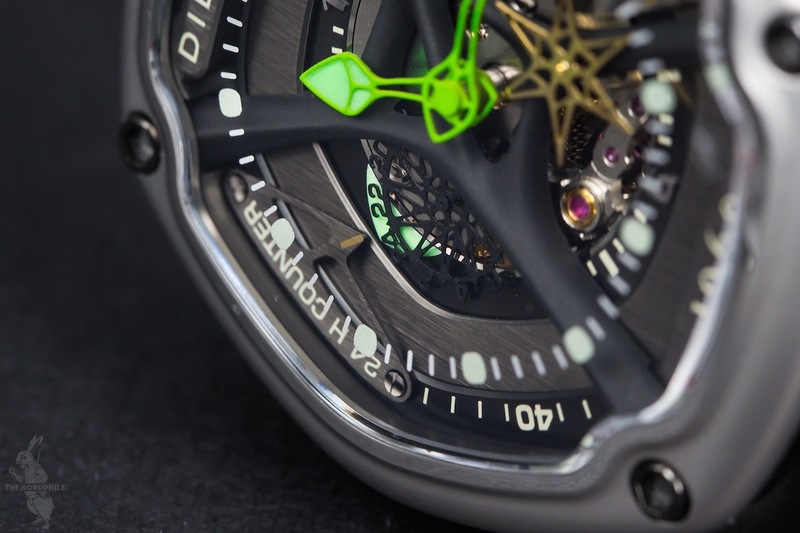 So while Dietrich 1969 watches are designed in Switzerland, they’re made almost entirely in China. 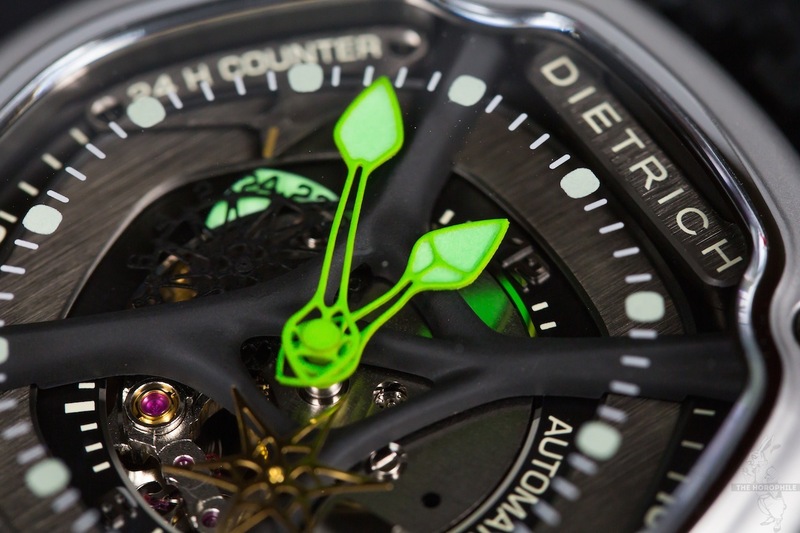 Now if you had asked me a few years ago I would have cringed at the thought, But when you consider that Chinese manufacturers are buying up the same CNC machines you’ll find at some of the most prestigious Swiss watch manufactures, they’ve really come a long way in terms of capabilities and standardized quality. 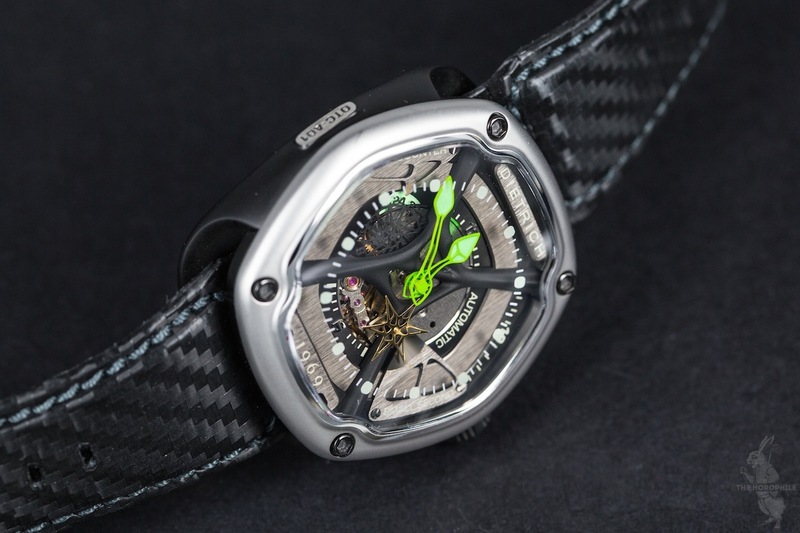 Since I’ve gotten over the “Made in China” stigma with the purchase of my SevenFriday P2 last year, provenance doesn’t and shouldn’t matter at this price point. Now let’s get to the actual watch. For the brand’s debut model OTC-A01 (Organic Time Companion model A, version 1), Emmanuel Dietrich drew inspiration from the natural world. I’m not talking floral patterns and Fibonacci sequences here, it’s more about the shapes and surfaces. It’s that mix of smooth angles and rounded edges with rougher brushed textures and geometric, angular forms that make it reminiscent of all things created by Mother Nature; in and out of planet Earth. 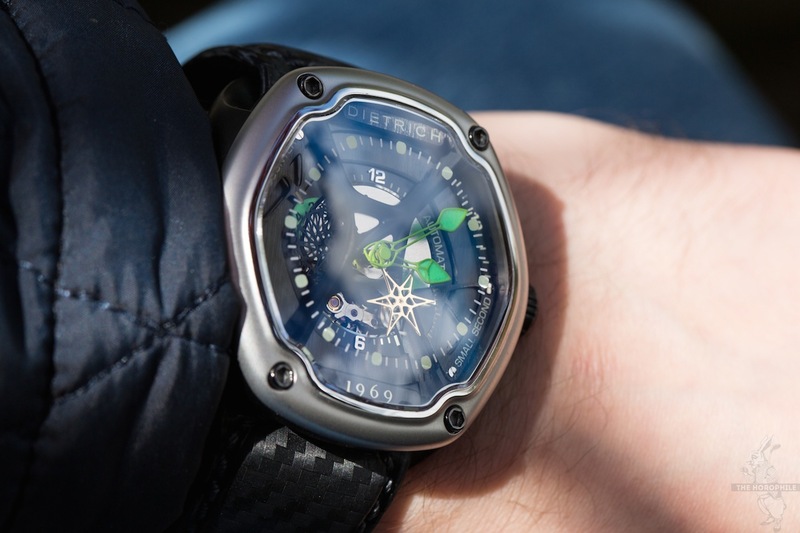 It has a certain sci-fi vibe that a lot of us geeky watch-lovers find delightfully nostalgic. 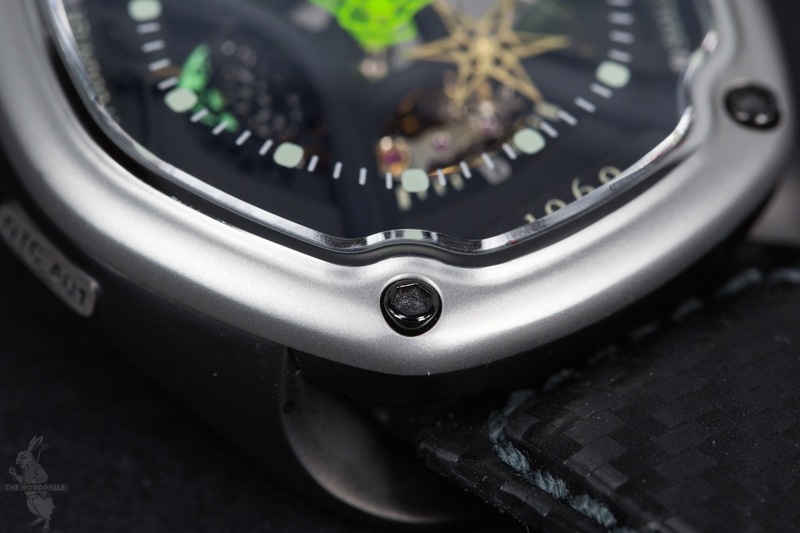 The case has a multi-component construction featuring a distinct central case done in matte PVD-coated steel, with an oval-ish bezel in bead-blasted and polished steel fixed by four black hex screws. The watch measures 48 x 46mm, which is definitely on the larger side of things. But keep in mind that the watch doesn’t have any lugs per se. 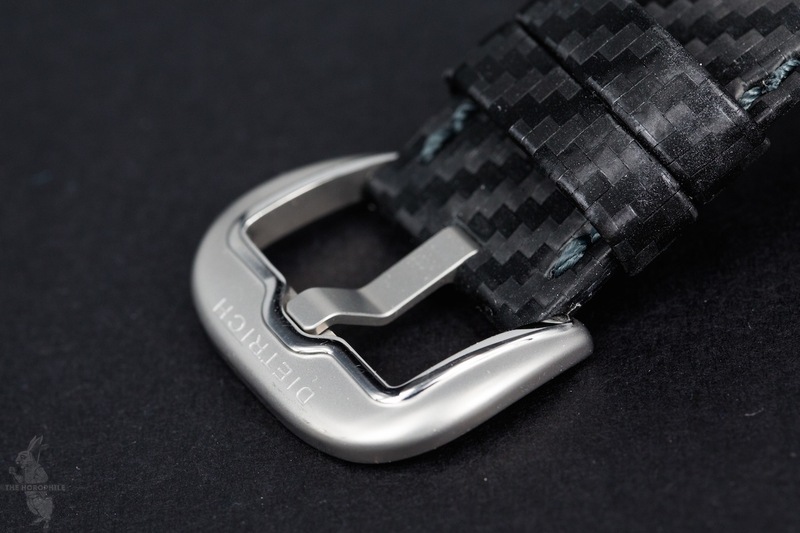 Instead, the bottom part of the case has two Cantilever-style “legs”, where a single-piece strap slides through. An unusual construction for sure, but one that is both functional and enticing. Another impressive detail is the angled and slightly domed crystal, which I was surprised to learn is done in sapphire instead of more fragile (and cheaper to produce) mineral glass. The crystal has an anti-reflective coating only on its underside, making that blue glare much less visible than on double-coated crystals. 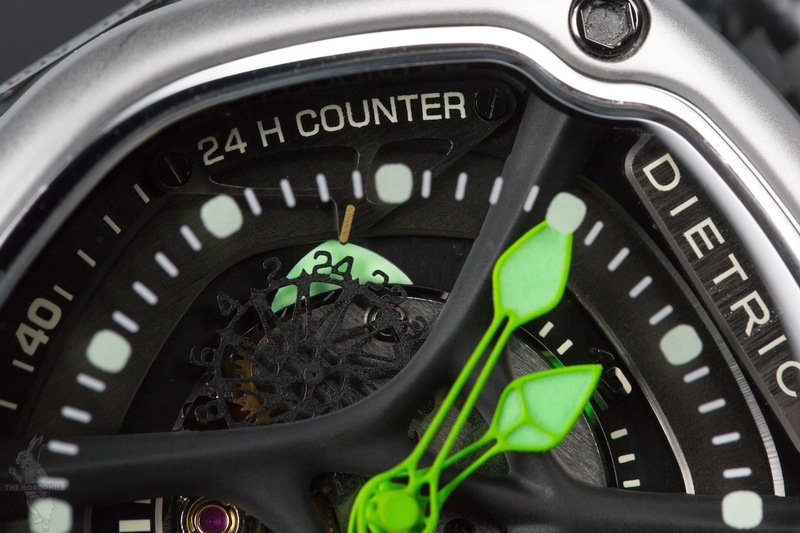 The crystal is also a part of the dial, with the minute markers printed on its underside. The 5-minute markers are done in luminous paint, though given the rather thin application they don’t really glow much. 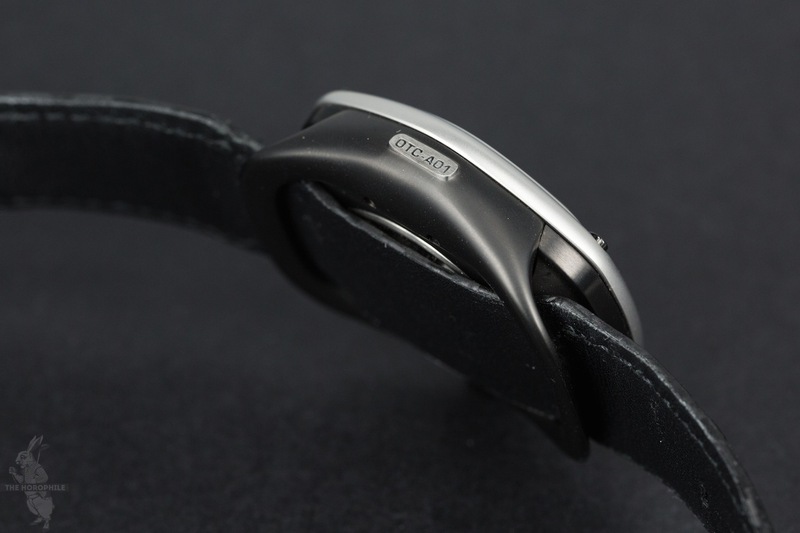 Even the tang buckle has been fashioned with the same edge design of the bezel and sapphire crystal. Looking beneath the glass, you’re treated to a highly voluminous four-part dial. At the highest point you have the impossible-to-miss vibrant green hour and minute hands, which some have likened to sprouting leaves. If you look closely, you’ll notice that the hands have a step raising the tips. With copious amounts of luminous paint and a fluorescent color thought out, the hands are incredibly easy to read at a glance. Under the hands you’ll notice the rounded “X” structure, which gives the illusion of continuing though to the screws on the bezel. A purely decorative element, the “X” fills the dial real estate up nicely and helps to visually balance the different indications. Underneath that, the sides of the dial as well as the raised Dietrich 1969 plaques are done in vertically brushed anthracite, playing with light and constantly morphing the dial. 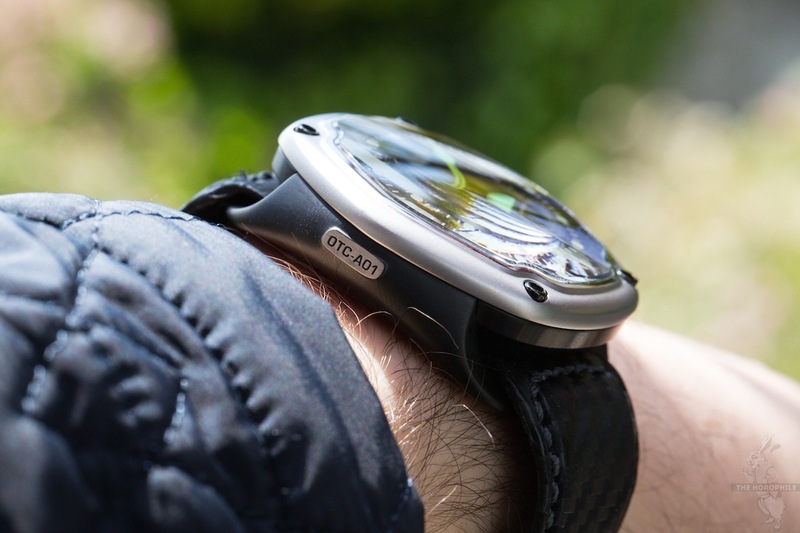 Instead of just hands, the OTC-A01 offers other animations on the dial to captivate the wearer. 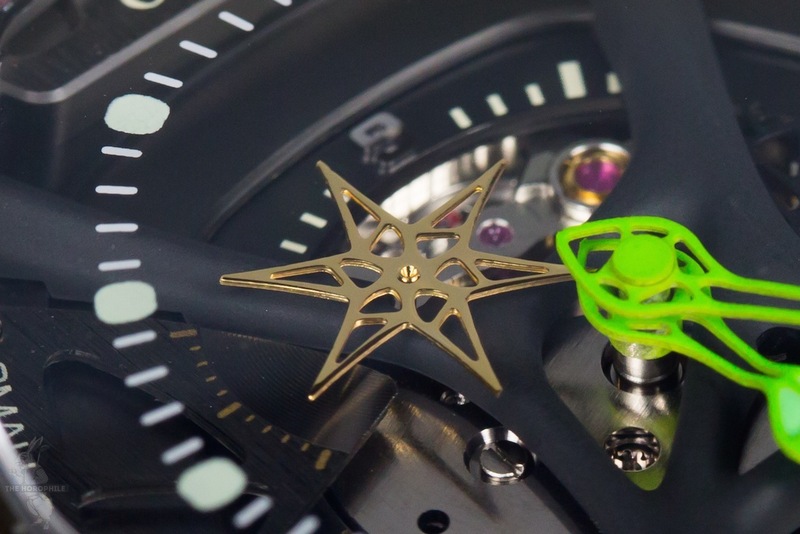 The hexagonal seconds disk at 4 o’clock stands out with its 6-prong star shape done in a polished yellow gold tone. At 10 o ‘clock there’s a similarly fashioned disk with 24-hour indicator, paired with a luminous back for easier reading. At 7 o’clock you have an opening revealing the movement’s escapement, though personally I would’ve preferred it without the aperture. Speaking of the escapement, the watch runs on a modified automatic Miyota (Citzen) 82S7 movement, a robust workhorse of a caliber that performs fairly well in terms of timekeeping accuracy. Hard to measure the exact rate at home since there’s no actual seconds hand to reference, but I can tell you that it hasn’t gained or lost a minute in the 5 days I’ve had it in my possession. 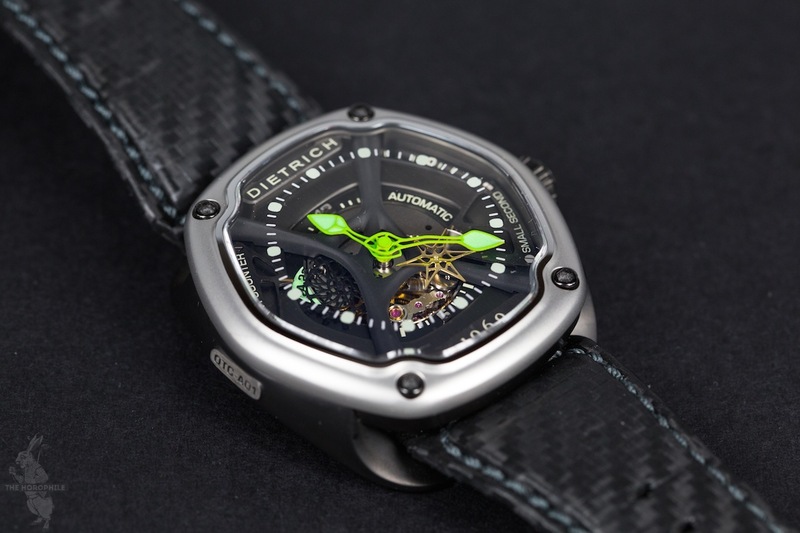 On the wrist, the Dietrich 1969 OTC-A01 is really, really comfortable. Because of its unique construction, there actually isn’t much of the case in direct contact with your wrist. 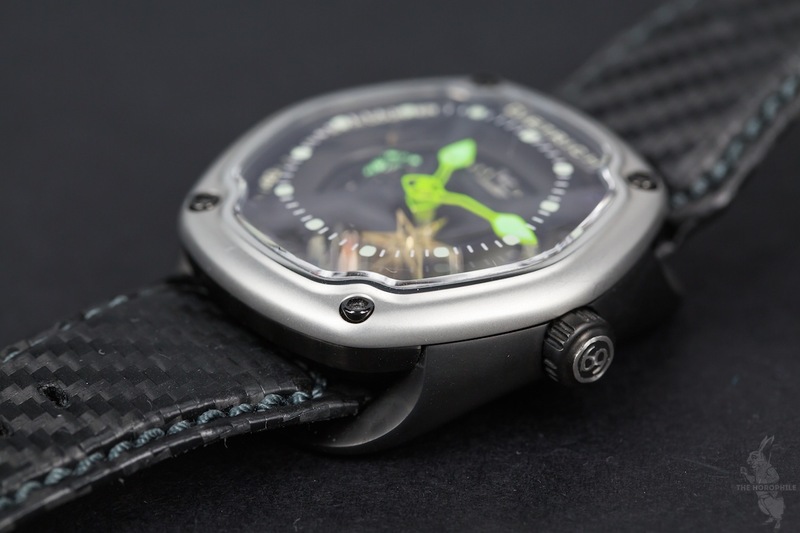 The curved underside with the strap sliding through makes the watch wrap around the wrist without any awkward spots. It certainly doesn’t feel like a 46mm watch. With a price of 1’255 CHF, you really can’t go wrong with the Dietrich 1969 OTC. Besides the OTC-A01 model I got my hands on (a prototype, by the way) two other color versions are also available. The watch also comes with NATO-style strap, with several other bracelet options like calf and alligator leather in the works. Great review! Very well laid out and detailed, also loved the pictures!